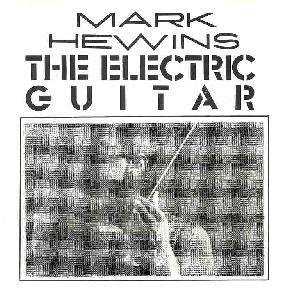 Mark Hewins - "The Electric Guitar" / "Big Big Spaces: Transmissions From Intergalactic Space"
Guitarist Mark Hewins has long been associated with the Canterbury scene and many of you may have seen him on tour with Gong in 1999. On "The Electric Guitar" and "Big Big Spaces", Hewins explores the ambient and atmospheric possibilities of the instrument and the decade plus span between the two recordings makes for two sets of different but still related music. "Aquafricare" opens The Electric Guitar set of ambient guitar explorations. This is music typically produced with keyboards or synths. But what's gorgeous about these pieces is that there's no question they're being produced by a guitar. No high tech effects. You can feel the slide up the fretboard, the strumming, the tapping... a handful of pure sounds that echo from the speakers and create an atmosphere of dark calm. I really like the segments where I hear a quiet but steady sitar sound accompanied by a low end drone. An interesting combination. The CD liner notes point out that "Han's Plan" is the only track that follows a set idea and mentions its relation to jazz forms. The track is still in the atmospheric ambient realm that the rest of the disc is in, but I felt like Hewin's was playing a spacey avant-garde heavy metal solo if that analogy makes any sense. I wish it developed a bit beyond it's 5 minute length. "Beside The Iron Wall" has a bluesy feel, maybe even a bit of folk. This track has the most conventional guitar work on the disc. It even has a bit of a groove to it, though it still manages to retain the floating quality that characterizes the set as a whole. "Aquafriction" is similar to "Aquafricare", though more abstract, perhaps even minimalist. But the sounds and resulting mood are intriguing. The music runs through a number of segments throughout it's 19 minute length and even though it creates a spacey world to get lost in I was still aware that Hewins was exploring his instrument and there was even a feeling of playfulness at times. "Big Bend" was recorded two years later than the previous tracks, which did their magic with a guitar and no effects other than reverb. Hewin's uses a Casio Guitar Trigger and Sampler on this track, and the result is a cool tune that combines recognizable guitar with more synth related sounds and a flowing orchestral background. On Big Big Spaces Hewins explores the deep deep realms of ambient space. The music is very subtle spacey atmospheric music, the guitar being almost unrecognizable as the primary generator of sound. Low-end drones lay the groundwork for cosmic atmospheric pieces that soar quietly through the astral planes, focusing on the magic mantra that brings us just a little closer to nirvana. Keeping in mind that this is guitar-driven space music, and again, music typically performed with synthesizers made it all the more of an experience. As a guitar album I think I liked The Electric Guitar better, but in terms of pure space music this is cool stuff and I'd be interested in hearing the result of a team up between Mark and someone like Doug "Alien Planetscapes" Walker. Could be interesting. Big Big Spaces consits of 9 tracks totalling over 70 minutes of music that you can check out online at http://musart.org/mp3/spaces. For loads of information on the entire Canterbury scene including Mark's work check out the Musart site at http://musart.co.uk. Contact via snail mail c/o Musart, 81 Knollys Rd, London, SW16 2JW, UK.